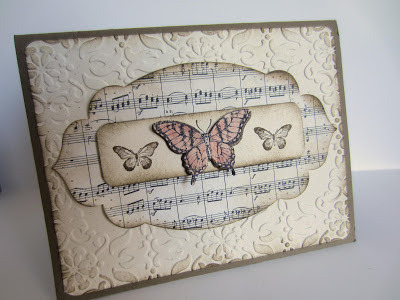 and popped it up with Stampin' Dimensionals over the butterfly I had already stamped on the Naturals Ivory strip. Run a 4" x 5 1/4" piece of Ivory Naturals card stock through the Big Shot inside the Vintage Wallpaper Embossing Folder. Round all the corners. Sponge all edges with Soft Suede ink. Using the largest of the Apothecary Accents Framelits in the Big Shot, cut a frame from the music. Sponge the edges with Soft Suede ink. With the musical piece positioned underneath the appropriate mat from the Essentials Paper Piercing Pack, pierce all along the edges. Adhere to the card front. as well as one of the smaller butterflies on each side of the large butterfly. Round these corners and sponge the edges. On a scrap of Naturals Ivory, stamp the large butterfly in Black StazOn ink. 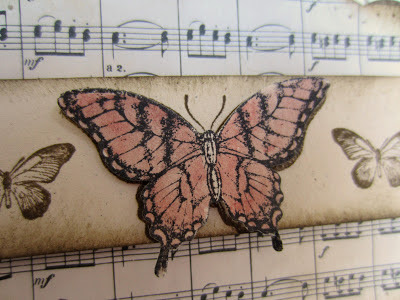 With the Watercolor Wonder Crayons and an Aqua Painter, paint the butterfly in your choice of color.When the butterfly has dried completely, punch it out and adhere it over the previously-stamped large butterfly with a Stampin' Dimensional. Gently pull the wings upward to add to the 3-D effect. 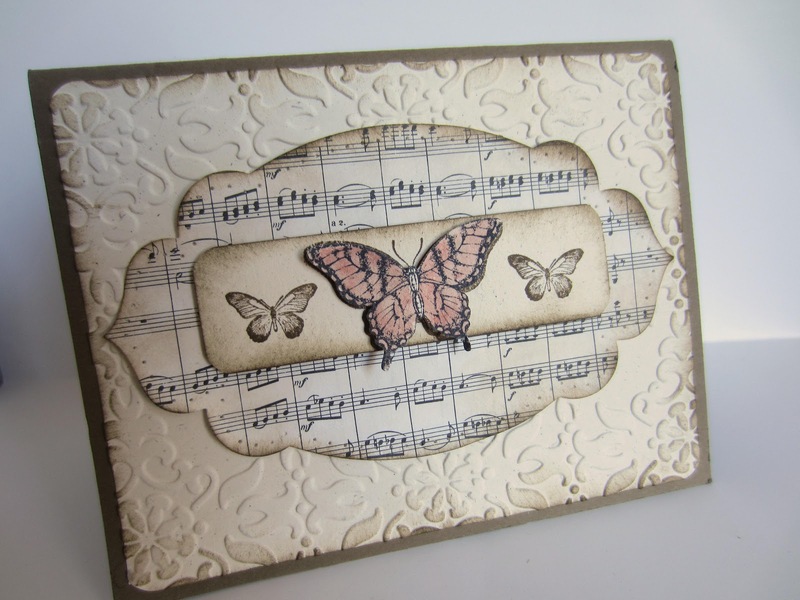 Attach this completed strip to the center of the music with three Stampin' Dimensionals. Add your sentiment of choice inside the card with either of the inks. on the appropriate box(es) on the right side of my blog. Very pretty! I love how you made it. Oh, very pretty. I love the vintage contrast with the natural. Thanks for sharing how you made this. Great tutorial. And that is absolutely adorable! Another stunning card Linda - I love your use of music!! Wow! I think I repeat myself when I comment on your cards, but when I see them I just think wow! Very beautiful. Glad you shared on I Gotta Try That.